On the back terrace we have some comfy couches and a hanging pod chair where we like to entertain on a nice day. Its casual, relaxed … a lovely spot to catch up and laze away the afternoon. The last two guests have sat down and within minutes remarked … “look, there’s a bird in the bird feeder”. As soon as I look, they are gone, but now I realised why I never see them … I’ve been sitting on the wrong couch! (For some reason guests always gravitate to the couch with the view of the mountain and bird feeder). So I resolved to spend an afternoon on the “other” couch, by myself. My entourage (dogs) settled down to sleep, I started to read and within minutes … look who came to eat the apples!! It’s the Rooibesysie I wrote about here. 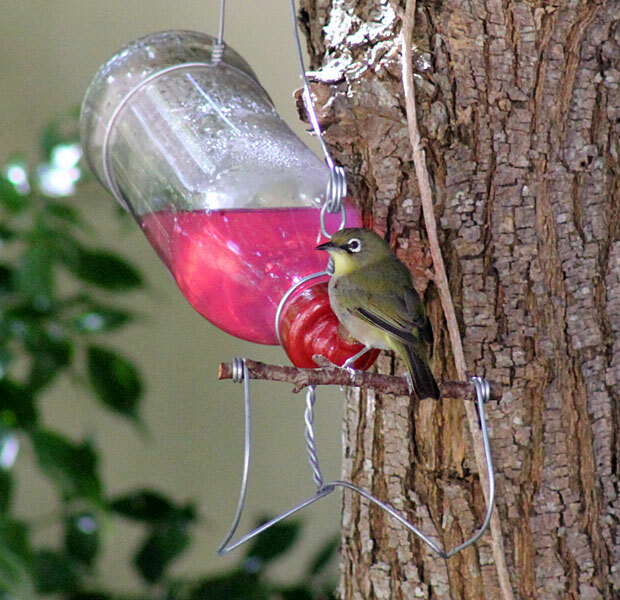 His (or her) first visit was brief and was mainly inside the feeder – I got a few shots but nothing worth showing. Then it came back and spent a full five minutes eating apples, bird seed and then sat in the opening for what seemed like ages looking up and down and around before it eventually flew off. It’s not the same one from last week – the eye markings are slightly different if you look carefully at the photos, but I’m delighted to know they are using the feeder and eating my apples! … I’ve only seen the Rooibeksysies at the feeder, doves in the trees and at the front garden’s bird bath, Sunbirds seem to stick to the Hibiscus and Frangipani … etc. I’m loving the birds in my garden and going to research to see what I can do to attract more. Perhaps something different to attract another type. Any suggestions? It is so fun to watch the birds in the winter when there’s not a lot of blooming going on in the garden. 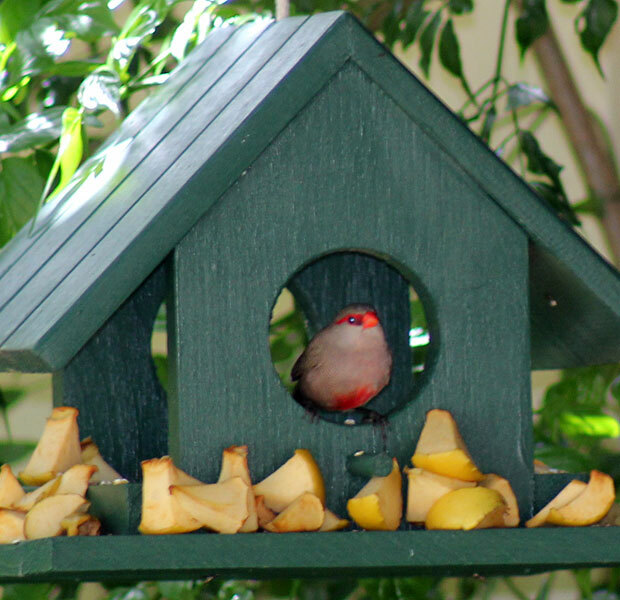 I put seed in my feeders the other day and — if you build it, they will come. Cardinal, titmouse, chickadee, wren, goldfinch…and a couple more I can’t immediately identify. I need to try putting out some fruit; just afraid it might attract some unwanted critters too. Just added your blog to my sidebar. Looking forward to looking back to previous posts to catch up! Add plants for shelter, nesting boxes, water and plants for natural food…it is so much fun isn’t it!! Awwww…………the birds are so pretty in your part of South Africa. Well, here in New Jersey, USA, I don’t have to do anything to attract birds. Give seeds and they come because it is winter here and no food. They also come during summer though there are foods around (may be there are no foods around with all these habitat loss and thus they come). How beautiful they are. I love their little red masks. LOL! Zorro dressed in red. It is so fun to see pictures of birds that we never see around here. Oh that is so amazing!! What a beaut of a bird!! I also love love watching birds. So weird, because when I was younger I never knew why people were keen birdwatchers! I had the sprinkler on today and the doves and the bishops and the weaver birds came to “shower” – it was amazing to watch. I need to get binoculars or a tele-lens for my camera. Flowers with nectar for the sunbirds (but I’ll have to think hard about shade loving). Shrubs with berries, I wonder if Halleria would grow for you? Don’t you get thrushes and Cape robins picking thru the mulch for bugs? Hi Diana – I haven’t seen thrushes or cape robins – but then I haven’t been looking. Will keep my eyes open. But on the ground, VERY rarely see birds – because of my dogs & cat! The birds stick to the trees. The birds do sometimes eat the berries off the Nandinas. I’ll check out Halleria – there are a few sunny spots – maybe I can sneak in a few – I also see Witoogies eating the little appley things that are growing on the Crab apples now. How fun! So long as you’re feeding some apple, how about a little citrus? An orange cut in half perhaps? Here we have species that are especially attracted to citrus, like Orioles. Might be worth a try to see if anyone different shows up! 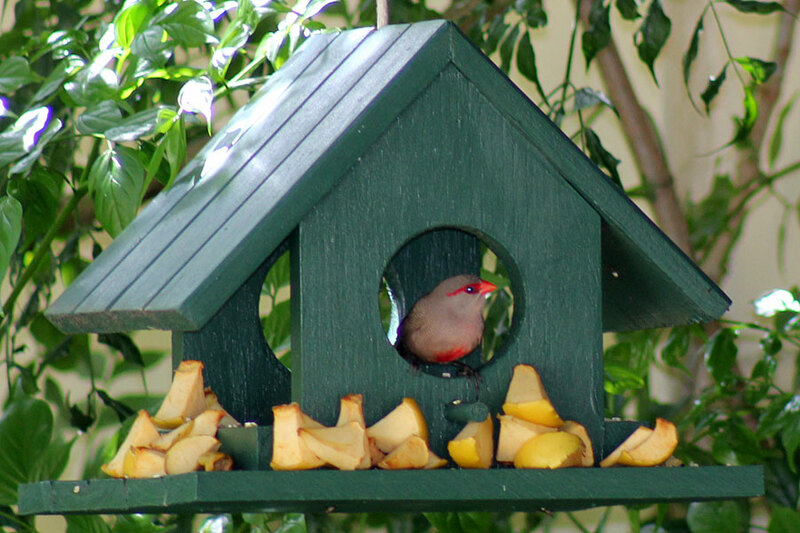 reminds me to add some apples to my bird feeder. Sadly, we have a Red-Shouldered Hawk couple in the area, they do scare away the song birds. Hopefully they’ll move on soon. Yay! I’m glad you’ve finally found your hungry bird. It’s amazing how much joy they bring the observer. I’m gonna add some fruit too but I have a feeling the squirrels will be carrying it away. I think there are ways to hang it for the birds…I’ll have to do a bit of research. Hi Cat!! I don’t think squirrels would get to my feeder – it hangs from a rope on a branch … would have to be a very acrobatic squirrel. They all are (acrobatic I mean), especially if they’re hungry enough, and they usually laugh at ropes and any other device you use to keep them out. Maybe African squirrels are more laid back than ours. Just kidding, although post audio if you do. 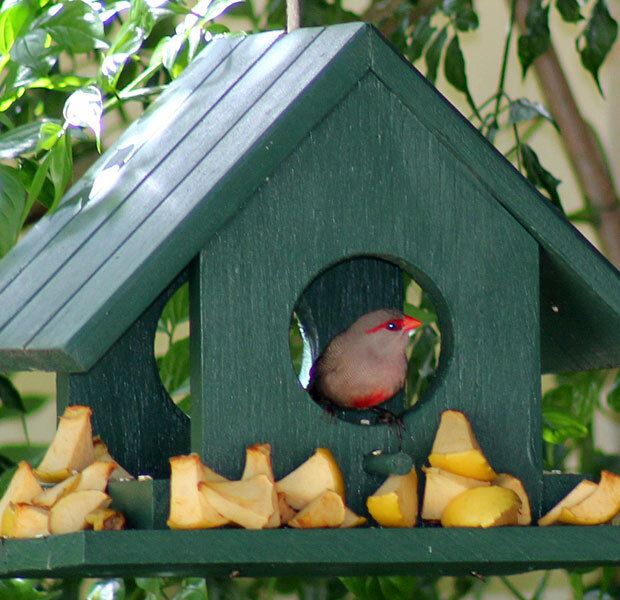 Different types of feeders (for instance here finches need a different feeder type), or different placement. Some birds like to eat in the open, some on the ground, some from feeders closer to trees. Also, water. Birdbath is necessary, but some birds prefer moving water. Oh Alan, thats so funny! With Audio!! Ok, so I have to go and get a different feeder or two and put in different areas. I do have baths – 2 with still water and three in the water feature with moving water. Those are booked up by the Starlings and Doves use the the front still ones, so maybe another one at the back for “others”. Haa! That is so funny!!!!!!! !